While scams proliferated in the unregulated world of virtual currencies over the last year, a company in Switzerland called Envion seemed to be one of the more legitimate outfits creating its own cryptocurrency. But like so many other projects that have pulled in millions of dollars through I.C.O.s, Envion is now melting down, with the people who created it accusing one another of fraud. There is no functioning business in sight. And investors are bonding on social media about how much they figure they lost on the project. Now is a great time to start accumulating beat up projects on Bittrex that have upcoming milestones in 2018. The exchange announced that they will start granting traders the ability to exchange digital tokens for fiat, following a new alliance with Signature Bank and other yet to be confirmed banks. Although this will be available for corporate clients in only a few states, it could have a big impact on the exchange’s trading volume. And we should start to see an influx of capital and new investors onto the platform. Kevin Abosch is turning the technology behind cryptocurrencies into art by stamping blockchain addresses in his own blood and selling a virtual neon Lamborghini. After months of intense attention on blockchain technology and the Ethereum blockchain, Consensys pulled together statistics from across the network to provide a snapshot of Ethereum today, its past, and its roadmap ahead. Multicoin Capital (a favorite here at CoinSnacks) recently released a curated selection of panels and presentations from their summit in May. You can watch the videos here. A long but interesting read from CryptoMedication accusing Bitfinex, Tether, Kraken, Barry Silbert (owner of DCG), Roger Ver, Erik Voorhees+the CME and many other actors in the market who appear to all be complicit in market manipulation of some sort. Thought leader Anthony “Pomp” Pompliano digs into how and why Security Tokens benefit regulators more than any other market participation. 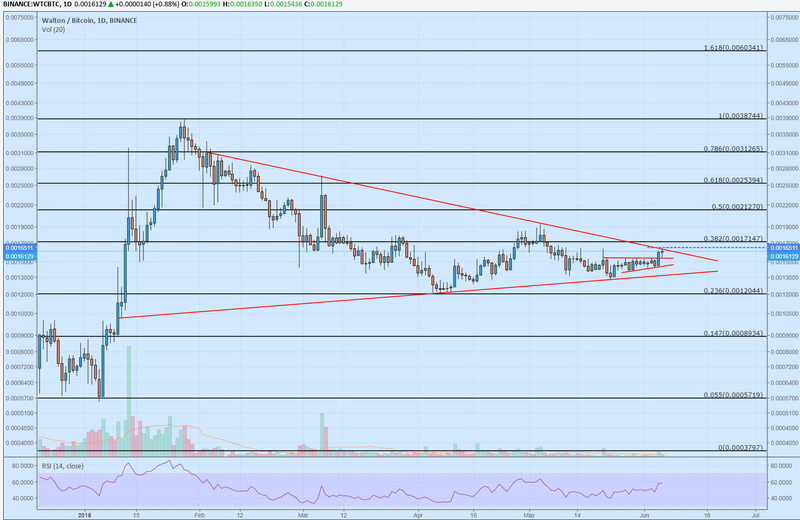 Waltonchain (WTC) is currently forming a large triangle that looks poised to break out. IF it breaks down though, it could retest the .236 support, so we only want to buy once it breaks out of consolidation. The volume has also been recently increasing and WTC will have significant news released in the month of June.